Location: No flash - natural light by the window. Indoors. 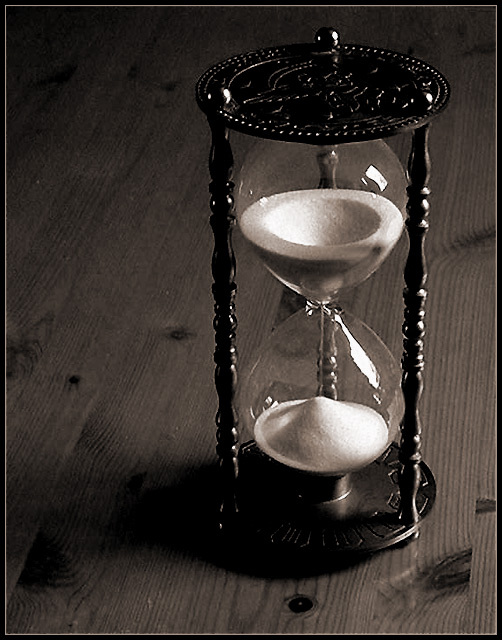 Nice crisp photo, lighting is good, not to much reflection of the class of the hour glass, good use of black and white. Nice photo, but a plain backgound would have been much more effective. Closer for the grains to show up. A very nice entry whose competitative edge may have been increased by a simpler background as the current runs the eyes around examining knots. Otherwise i like the concept and the wonderful hour glass. Bump. This gets a grin outta me. Simple and classic. Nice framing, love the natural lighting and the monochrome, and that was the perfect moment to take the shot. Also, the juxtoposition of wood with the sand grains is really appealling to my peepers. very dramatic lighting! LOVE IT! A little dark, the contrast with the wood showing a little more would have been so nice here.. Proudly hosted by Sargasso Networks. Current Server Time: 04/24/2019 08:12:11 AM EDT.